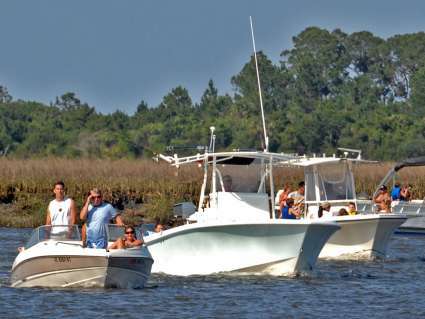 Throughout Jacksonville’s waterways, the Coast Guard, the Florida Wildlife Commission, and the sheriffs for Clay County, Duval County, St. Johns County and Nassau County will be on the lookout for boating safety issues this weekend. The Fourth of July weekend presents a very busy time for boats on our local waterways which results in an increased risk for boating accidents and personal injuries. Wearing a life jacket the entire time while boating is recommended. Just like a car accident, boating accidents come with very little warning. Since boats don’t have seatbelts, an accident can easily throw a person into the water. With strong currents and the possibility of injury or unconsciousness from the accident, being thrown from a boat can easily cause drowning. Unfortunately, some of the boaters will operate their vessels under the influence of alcohol. Operating a boat while drunk causes many of our worst boating accidents. Every year in Florida, and Jacksonville, we see significant injuries and death from boating accidents. Earlier this year 5 people were killed and many others seriously injured when a twenty-two foot boat carrying fourteen people crashed into a barge parked on the side of the intracoastal waterway in St. Johns county. If you would like to speak with a Jacksonville boating accident lawyer, please feel free to contact us for a free consultation by clicking here.